Up to 99 tares (optional) to store wheelchair weights for efficient patient weighing. Hold/Release key to hold a weight after leaving the scale for better patient care. Patient ID Barcode Scanning: Send 14-digit patient ID to the scale's MedVueR indicator for EMR/EHR records. Sturdy steel handrails for patient assurance and safety. 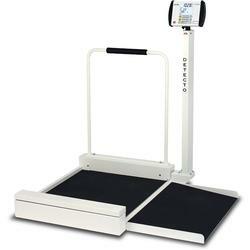 With Detects 6495 heavy-duty wheelchair scale, you receive digital speed and increased accuracy. From the scale's load cells to its durable steel construction to the hightech digital weight indicator, the 6495 is completely made by DETECTO at the company's factory in Webb City, MO. The scale's ramp with non-skid surface and padded handrails ease wheelchair or standing patient weighing.